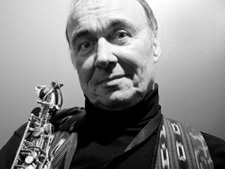 Alto Saxohonist John Jenkins. "John Jenkins with Kenny Burrell"
Alto saxophonist John Jenkins was prominent in the late 50s as he emigrated to New York from his hometown of Chicago in March 1957. He first worked with Charles Mingus and recorded as a sideman. John was a very distinctive alto saxophonist and a well trained player. Tonight's Jazz Feature is his debut album that came out on Blue Note. John only did one other date under his own name but this one is a gem, Jenkins dropped out of the scene in 1960 discouraged by the "music business" and pursued other directions he resumed playing in the 80s but died fairly young at age 62 in 1993. This album has John and the great guitarist Kenny Burrell on the front line with Sonny Clark on piano, Paul Chambers on bass and Dannie Richmond on drums. It's a well balanced date with a mix of Jenkins' originals and two well-chosen standards. It's a fine debut but unfortunately Jenkins' musical career didn't pan out. He deserved more as you'll hear. Enjoy!